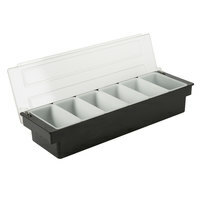 Keep your bar or restaurant stocked with fresh condiments by storing them in this Choice 6 compartment condiment holder. This black container features a flip-top lid made of white, translucent plastic. This allows the condiments to stay partially visible when covered for quick reference. When closed, the lid helps prevent cross-contamination and protects the food from air-borne contaminants. This condiment holder is ideal for holding condiments at a bar, but can also be used to hold food in your kitchen prep area, at a buffet, or in your cafeterias for an easy self-serve option. Got this awhile ago. Great product, easy to clean. It helps to keep my fruits fresh for so long, just need to add ice bags. I am so glad to have found this! It works great to store and keep our pizza toppings chilled and at our finger tips, ready to use. A very affordable option for our small business! Great for storing bar garnishes. Plenty of compartments for all of your bar's needs. The bins are easy to remove and clean up quickly. Plenty of room for ice in the bottom part. This condiment holder is well made and allows for many different types of condiments to be available in a small space. Nice item for our bar. I really like these condiment holders they come all apart which makes cleaning super easy. Also there is space below the compartments to add ice to keep it chilled throughout a shift. Great holder! Holds ice bags perfectly, and keeps your condiments really cool for the entire day. I used to use ice, but ice bags work so much better. This is a great product at an fantastic price. It stores all the ingredients for a salad bar in one container. It is sturdy and very easy to clean. Great container for bars! we put our limes and lemon wedges here along with cherries and coconut flakes. easy to clean and easy to work with in the middle of a busy shift. Just your basic condiment holder. Works well at the bar with the 6 compartments for oranges, lemons, limes, cherries, and various olives. Great price on this. This is a nice thickness and is really sturdy. Love this. We had the older silver flip top one and that thing lasted us 6 months. Well made and the perfect size to use while mixing drinks. Can be used for a variety of items from fruits to nuts and more the possibilities are endless. THIS 6 Compartment Condiment Holder IS WONDERFUL AND IS QUALITY MADE. PERFECT FOR BUFFETS TO SERVE TOPPINGS IS STYLE. I GOT LOTS OF COMPLIMENTS..THE INSETS THAT COME WITH IT ARE A NICE SIZE AND EXTRAS CAN BE PURCHASED SO YOU CAN HAVE THEM PRE-FILLED AND READY TO REPLACE STOCK QUICKLY. IF YOU NEED BIGGER COMPARTMENT SIZE WEBSTAURANT SELLS THEM BIGGER (ONE BIG WOULD SWAP OUT 2 OF SMALLER ONES) INSERTS ARE MADE OF TUFF HIGH QUALITY PRODUCT AND ALL WASHS SO EASILY..THE PRICE WAS SO GREAT I BOUGHT A FEW. Sturdy, easy to clean, works great. We've used the same one for quite a while now, and it goes in and out of the fridge probably 15 times a day, 6 days a week, about 2 years now... you do the math--it holds up exceptionally well for an extremely low price. We have bought a few of these and they are a great value for the price. We use them at farmer's markets for samples and they make for a nice presentation. There is plenty of room for ice or ice packs in the bottom to keep food chilled. Our biggest complaint is that the actual bin and lid are not dishwasher safe and there was no indication of whether or not they were - we found out the hard way and warped one of the lids fairly badly. Great for a bar top and it still has a small space on the bottom to fill up with some ice cubes. We used this outside and it was great! This thing is a life save in our food truck. Allows us to keep sandwich toppings cold without spending a fortune on a refrigerated prep table. We just stick it back in the fridge when we're not busy. Only complaint is the ice packs that webstaurant recommends don't actually fit. Added treat for our backyard pool bar. Makes us feel like we are in the Caribbean when we doctor up the drinks with this! Love it!!! Very heavy duty plastic. Lightweight and not big and bulky or heavy. Very easy to clean and replace compartments securely. We use this for fruit and don't see having any immediate issues with fruit acid eating the plastic. Kept all of our garnishes cold for over six hours, and there was still ice in it at the end of the party. I've used product like this before, but the thickness of the ice bin is what sets it apart. If you are looking for a way to keep garnishes cold and still allow for easy clean up, this is it. The 6 Compartment Condiment Holder exceeded my expectations. The price is very reasonable and the quality is pretty good. I highly recommend this product. I am giving this item a 5 star rating. I purchased this item for home use. I purchased it for the bar at my event and it was perfect. The bartender said it made his life so much easier. The little white containers leave plenty of space for ice on the bottom. This condiment holder is so great, particularly for serving hotdogs. Customers love to receive the hotdogs from me and then they add there own toppings from this condiment holder. Easy clean up. Great caddy for condiments, good quality plastic, love that the lid is attached and won't come off at all during rush hour specially, we ordered and right away they sent it, great timing! This is a standard condiment holder at a great price. The condiment holder uses all standard sized fruit cups and is easy to clean and sanitize. Much smaller than I expected. There is not much room under the containers for ice so my toppings don't stay cold very long at all. We use these for garnishes for wine cocktails. Holds the perfect amount of fruit and has space under for ice to keep it chilled. The trays are easy to slide in and out and the plastic is durable for high use. We bought a few of the Condiment Dispensers (808102) for different uses. They worked very well for Onions, sour cream, shredded cheddar and jalapeños when serving chili on our buffet. But they were also perfect for holding packets of sugar, stevia and artificial sweeteners at our coffee section. They are well made and much better than I expected for the low price point. We purchased some of the quart inserts some could have the option of different sizes in the dispenser and it worked out very well. Great condiment holder. Seems to be great quality. The slots are large and hold a good amount and there is room under to hold ice if needed. I absolutely LOVE these trays! They are perfect for serving condiments that need to be kept cold. I've used these for taco bars, baked-potato bars and for cookouts. Everyone comments on how adorable the idea is! They store a small amount of ice or the ice packs under the actual condiment containers that keep everything nice and cold for a good amount of time. Great product! This item held all my garnishes that I needed. This is the perfect amount of compartments. It is also very durable and easy to clean. This is a nice large condiment holder. I like the size and shape, but the walls are not thick enough. I place lemons and oranges inside and I am worried that it will go bad, so I use ice packs underneath them. I tried to avoid using it unless it is extremely necessary. For those looking for a condiment holder that will stay out in room temperature for less than 2 hours, I would recommend this. It is a great value. love it!!! i keep all my condiment for my drink in this holder. make life so much easier and keep everything organized. i would buy again. What a great product. I got this to organize my picks and it works perfect for them! I can buy the extra trays and exchange to food products if need be and keep my picks in the trays if i want to. I love this product. Will be buying a second. This condiment holder comes apart easily so it is easy to clean. It has enough compartments for our needs. It fits perfectly at our bar. Super Item, well designed, plenty of room for our needs. We like it, as you can add ice or a ice bag with inside of the housing to keep your items cool. I use this tray to hold my condiments for my hot dog stand. This holder seems to be very sturdy. Customers are constantly opening and closing it and i have yet to have any issues with it. It was dropped from about 3ft onto concrete and nothing broke! Cleaning is very easy and takes no time at all! I love the black. In the past I have purchased totally clear or stainless steel and wasn't happy about the fingerprints and water spots. I love that this holder holds ice or ice packs too. Very satisfied. We have a few of these. Perfect for holding all our cut fruit behind the bar. We also use it in the kitchen to store chopped herbs and garnishes. Great quality. Holds a great amount of variety condiments. Worked perfect in the bar. This is also very easy to take apart and wash. Buying more. Best price found on the net, very sturdy, and the percfect size, we have two of these in our condiment section of our concession stand. A must have for any bar that serves cocktails, it holds a decent amount of items and stays chilled for couple hours when you add ice under the trays. We started using this for sugars instead of fruits like the normal usage. Our drive thru has each type of sugar now in it's own compartment with a spoon instead of using multiple packets. Easy to clean and looks organized and tidy on the counter. This is a very nice product. Each compartment has plenty of room to hold a large number of drink garnishments. Very well constructed and with a classy look. Our other condiment holder sat at an angle and could be tipped over easily. This may not be a fancy holder, but it does the trick without all the mess. We purchased the Rubbermaid white quart insert containers for olives rather than filling 2 of the little containers and it fits perfectly. These condiment/garnish holders are great. They're huge and will hold everything you need to stock your bar or buffet table. Good quality, easy to clean, and very functional. This tray is very nice for organizing your bar garnishes. We used to use a 4 compartment tray but now we can fit oranges and cherries to speed up our prep times. This is a good item for holding fresh garnishes for bartenders! It works well for a unique taco bar too! Easy to serve cheese, peppers, lettuce etc all on ice too!! Wow what a deal! We catered our daughters wedding but wanted it to look like we paid for it. So finding great buys like this is what made it look perfect!! This is very sturdy and i love that it holds ice too!! I use this for my garnishes for the bar. This works great for keeping them fresh and free of any contaminants. You can fit orange, lemon, lime wedges and/or twists, cherries, and olives, or whatever else you may use. Easy to clean up too at the end of the night. Great price and does exactly what I needed, especially in a small work area. I'm using this for my hotdog condiments: onions, slaw, relish, shredded cheese, kraut. Only drawback is not a lot of room for ice under compartments. this 6 Compartment Condiment Holder works really well for me with my salt and pepper along with my spices when i am cooking in the kitchen.